Toasty Honey Corn Loaf from "The Staub Cookbook." The Staub Cookbook, written by food blogger Amanda Frederickson, is full of contributions from stellar chefs and well-known food writers. Notables include Tieghan Gerhard of Half-Baked Harvest, Molly Yeh, Nik Sharma, Joseph Keller from the Company of the Cauldron (one of my favorite Nantucket restaurants), Matt Lewis and Renato Poliafito of Baked, and Mimi Thorisson, to name just a few. The combination of Staub cookware, that beautiful French workhorse, and delicious, accessible recipes created by some of your favorite chefs and bloggers earns an inspired spot on your bookshelf. The Baked boys delivered with what is now my go-to corn bread recipe, the toasty honey corn loaf. After arduous research with many failed or meh results, I finally found the corn bread of my dreams: slightly sweet with a crisp crust and a tender crumb. Perfection. The superb chocolate morning babka buns from Michelle Lopez of Hummingbird High are a not-too-sweet breakfast roll filled with chocolate, cinnamon, and brown sugar, dusted with confectioner’s sugar and sprinkled with toasted almonds. They’re a delightful way to start a chilly morning. Kung pao cauliflower, a vegetarian riff on the classic Chinese dish, delivered layers of flavor and was inhaled by my family so quickly I almost didn’t get the soy/rice wine/hoisin/sugar finishing sauce on the cauliflower. Another heartily enjoyed vegetarian option was the kale, quinoa and butternut squash stew, a one-pot meal that goes fabulously with the cornbread. Next to try is the one-pan wild mushroom lasagna. Looking to add a chicken or beef recipe to your repertoire? Try the chicken meatballs in red coconut curry sauce or the beer-braised short ribs; both are full of big bold flavor with some unexpected interesting notes that elevate them. With March coming in like a proverbial lion and (hopefully) going out like a lamb, The Staub Cookbook offers recipes for any type of weather this fickle month may bring. The sweet potato enchiladas with roasted tomatillo sauce and Athena Calderon’s apricot almond yogurt cake offer a perfect cozy meal with the promise that spring is in the air. There are two schools of thought when it comes to corn bread: sweet or savory. This one is for those who fall solidly into the sweet camp, not surprising considering it comes from Matt Lewis and Renato Poliafito, the gentlemen bakers behind New York City’s Baked. Don’t worry, this corn loaf is still more bread than cake, with its tang of buttermilk and the soft mellowness of honey. 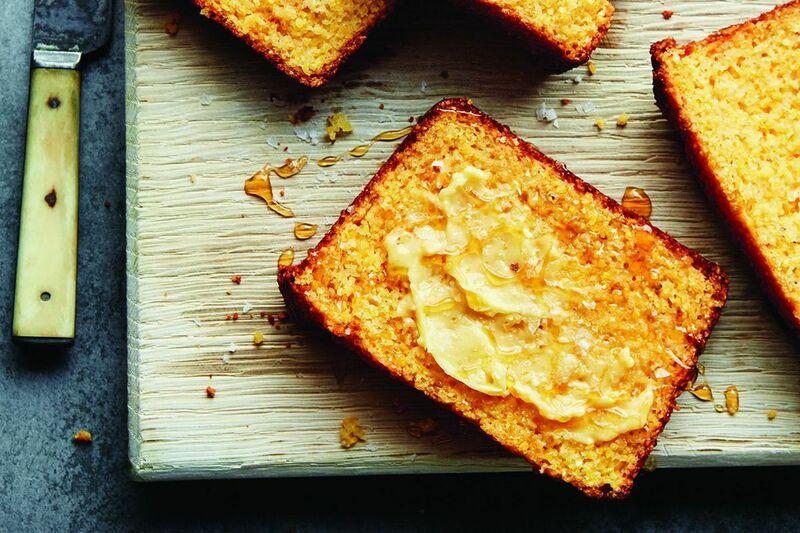 Topped with a pat of melted butter and a drizzle of honey, it is corn bread perfection. 1. Preheat the oven to 400°F. Place a cast-iron loaf pan in the oven while it’s heating. 2. In a medium bowl, lightly whisk the eggs. Add the buttermilk, honey, and melted butter and whisk until combined. Set aside. 3. In a large bowl, whisk the cornmeal, flour, baking powder, both sugars, and salt. Make a well in the middle of the dry ingredients, pour the wet ingredients into the well, and gently fold until just combined. 4. Carefully remove the hot loaf pan from the oven. Drop about 2 tablespoons of butter into the pan and swirl to coat the bottom, then use a pastry brush to coat the sides of the pan. Pour the batter into the pan and bake for 25 to 35 minutes, until the top is golden brown and a toothpick inserted into the center of the loaf comes out clean. Let cool on a wire rack for about 10 minutes before popping the loaf out of the pan. Slice and serve warm with a slather of butter and a drizzle of honey. — From Matt Lewis and Renato Poliafito of Baked. Reprinted with permission from The Staub Cookbook (2018 Ten Speed Press). Photography by Colin Price.